Last week we were able to spend a few days at The Homestead Resort in Midway, UT. We had a blast, and there was so much to do! It was obvious to us why Midway is a finalist as one of the prettiest places in America. While we were there, they had the last day of their Fall Festival. We were able to see the scarecrows on the lawn, as well as eat some yummy pulled pork sandwiches, fried chicken, and coleslaw. Every time we visit The Homestead, we begin our trip by walking to the top of the Crater. We were pleasantly surprised at the changes they have made on top of the crater. What used to be a chain link fence that you had to push your face against to see into the crater, is now a beautiful iron bridge that you can walk over the top of the crater and look down into it. After seeing it from the top, we walk around to the North side where you can go into the crater and feel the warmth of the natural hot springs that flows into it. Most of the time we see people scuba diving. The Homestead Crater is a great place to get your scuba diving certification. Their lobby has been completely remodeled, and we learned a lot about the history of The Homestead while checking in. The receptionist told us about the beautiful fireplace in their lobby, and that is was discovered while they were doing their renovations. Why is was covered up years ago, I will never know. It's a beautiful focal point, and gives the lobby a cozy, welcoming feeling. Upon check-in, the receptionist gave us each a sample of fudge to try, which was delicious! Our room was in the Shaker House. My 6 year old son was SUPER excited to see that there were "TWO SINKS!" Haha! We had to pull him away from the sinks just to get him to put on his swimming suit to go swimming. 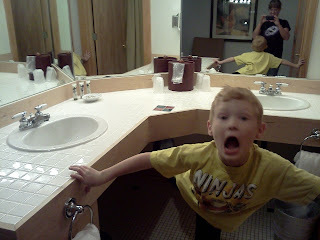 that our room had "TWO SINKS!" Even though it's Fall and cold outside, you can still enjoy swimming. The outdoor pool is closed, but they have an indoor pool, as well as a dry sauna. The pool is divided into two areas. One side goes up to three feet, and is heated. The other side goes up to six feet, and is not heated, but is still comfortable to swim in during cold days. My kids loved that there were float tubes already in the pool for guests to use. In the morning, we had breakfast at Fanny's Grill. The food was fabulous, and each one of us got something different. We all enjoyed our meal, even my pickiest of eaters 6 year old son and 8 year old daughter. After breakfast, they enjoyed going out to the deck and seeing the fish swimming in the pond. We even spotted some deer walking on the golf course. One thing we found out while there is that if you reserve a pet room ahead of time, you can bring your dog that weighs less than 20 lbs. We have a small toy poodle that we left home this time, so next time we will definitely be booking a room in The Bunkhouse where we can bring our family pet with us. The Homestead has an Activity Center ready to help you plan an activity at The Homestead or nearby. Visit them upon check-in, or check out some of our recommendations below. You can pick and choose what activities you want to participate in, or book one of their Vacation Packages which include your room and entertainment. The Homestead is known for it's wide variety of special events. Below are just a few. Their complete schedule of yearly events can be found on their website. History of The Homestead: From The Homestead website: In 1863, Simon Schneitter emigrated with his family from Switzerland to Utah. They came as a group of thousands of pioneer immigrants from many countries, arrived in Midway, Utah, and began farming. The alpine setting of Midway was reminiscent of Switzerland, making the group of immigrants feel more at home. In 1886, Simon discovered a large, curious-looking rock crater on his farm, with soothing warm mineral water flowing from the rock. It wasn’t long before Simon’s mineral water “Hot Pot” became a local attraction. With the help of his wife Fanny, they began offering meals and attracted even greater crowds. The Schneitters operated the family resort for 67 years where comfort, good food, and the hot water bathing became famous with guests throughout the United States. Today Homestead Resort offers guests the opportunity to return to a more nostalgic time, allowing each guest to create a classic American experience that cannot be duplicated—complete with charming accommodations, peaceful conference facilities, comfortable dining, and boundless recreation amidst classic architecture and incredible atmosphere. What others are saying about The Homestead: "We went to the Homestead resort to get a night away and have some mom and dad time," said Meridee McFalls, first time Homestead guest. "When we arrived we were greeted by very knowledgeable friendly staff. She gave us all the details about all the events going on up at the Homestead resort and exactly what we needed to do for our reservations for swimming in the crater. We enjoyed the scarecrow festival and events and the fall colors changing all around us. I thoroughly enjoyed swimming at the crater. 93 degree water is just what the doctor ordered for a weekend of relaxation! The fudge at the gift shop was amazingly yummy! The room accommodations were wonderful and we will be back soon!" Meridee's husband suggested they book a relaxing night away after seeing The Homestead in a travel magazine. Enjoy Utah was provided a one-night stay to write this review, but we were not compensated or persuaded to write any certain type of review. The opinions and views expressed in this review are all our own.